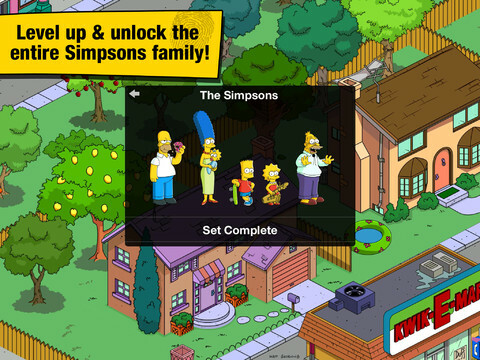 Homer and the rest of Springfield make a welcome return to iOS. Electronic Arts released The Simpsons: Tapped Out earlier this year, and players summed up the experience with a collective, "doh!" Although its developers had their hearts in the right place, with exclusive Simpsons cut scenes, multiple characters spouting humorous one-liners and a user-friendly interface, multiple bugs forced the publisher's hand, with the game on the receiving end of a Hulk Hogan-sized leg drop. Tapped Out was just that, as the free-to-play title was promptly removed from the App Store in what amounted to a Homer-sized catastrophe. Of course, longtime Simpsons fans know that when it comes to the show, everything works out in the end, and with that being said, The Simpsons: Tapped Out made a surprising return to iPhone and iPad last week, instantly joining the best freemium offerings on iOS. With this in mind, there's a great chance you've played this type of game before, as it does nothing to separate itself from the competition play wise. If anything, the presentation is what makes it a pleasant distraction from the stresses of ordinary life. Similar to the original version, Tapped Out tasks you with rebuilding the iconic Springfield following a nuclear meltdown at the Power Plant, kicked off by (of course) one Homer Simpson. From there, EA provides you with a relatively small plot of land, and it's up to you to erect buildings, decorate as you see fit and send a plethora of famous characters on a variety of missions, with the rewards being virtual money and experience points (XP). To that end, EA didn't reinvent the freemium concept with this reboot. Both construction and missions take different amounts of time to complete, with the option of speeding the process along with donuts. When those useful and tasty-looking treats run out, you always have a choice of buying more via in-app purchase. You can even exchange donuts for money, which comes in handy for buying more land and other useful items. To that end, it doesn't take long for things to become super expensive, leading you to go the IAP route, or simply put the game down for a few hours and come back to it later. By now, everything about The Simpsons: Tapped Out should seem familiar, as EA reused the same formula that creeps into these types of games on a weekly basis. The developers also let players invite and then visit friends' towns to collect rewards and vandalize property, but again, nothing new to see here; you'll need an Origin account to do this. Considering the facts, it's obvious that what makes Tapped Out so appealing is the license. 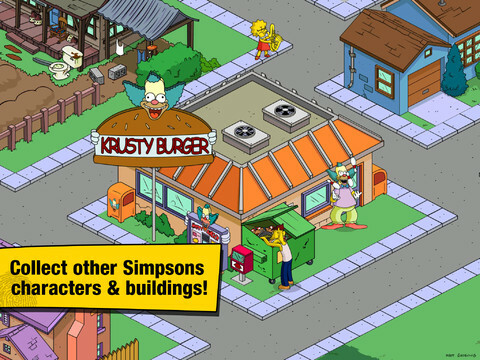 There's a scavenger hunt of sorts, where players track down characters, and the list runs the proverbial gamut, with the entire Simpsons clan on hand, along with Apu, Ned Flanders, Krusty the Clown and Hans Moleman, along with famous landmarks, like the Simpsons' home, Springfield Elementary and Willie's shack. Throw in animated scenes and, as we said, authentic voices, and there's plenty to love. We also like how, when a character gets assigned a job or mission, he or she changes outfits and/or animations that users can see on-screen. It helps add personality to the experience. What did EA fix? Much of it was behind-the-scenes, stability tweaks that prevent purchased goods from disappearing, along with better multitasking. The most obvious, perhaps, is Retina display support for the new iPad. 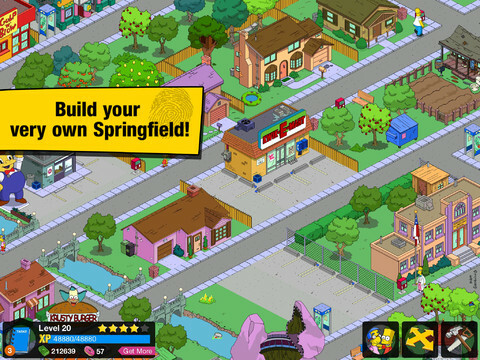 On that note, The Simpsons: Tapped Out does nothing new when it comes to freemium gaming, but the opportunity to create one's personal Springfield, along with trademark Simpsons humor, makes it hard to resist. It's less "doh", and more "woo hoo." What's Hot: Great use of The Simpsons license, familiar gameplay to freemium players, user-friendly interface, easy to earn money. What's Not: You need an Origin account to visit friends, game follows the same old freemium path.